Looking for a budget-friendly way to spruce up the walls in your home? 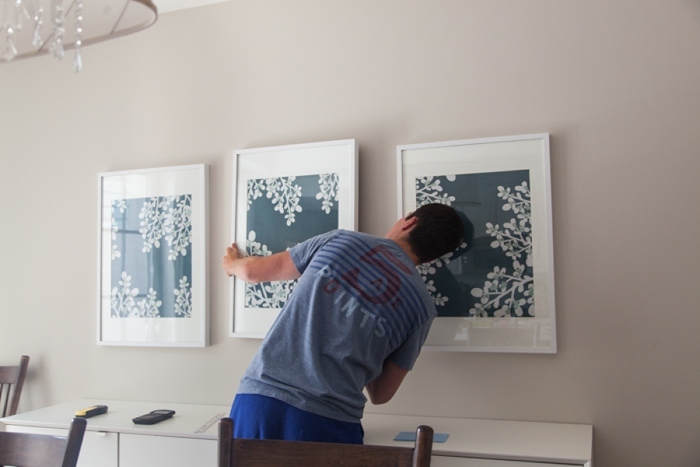 Inexpensive frames paired with giftwrap or wall paper, gives a modern, high-end look, and won’t break the bank! 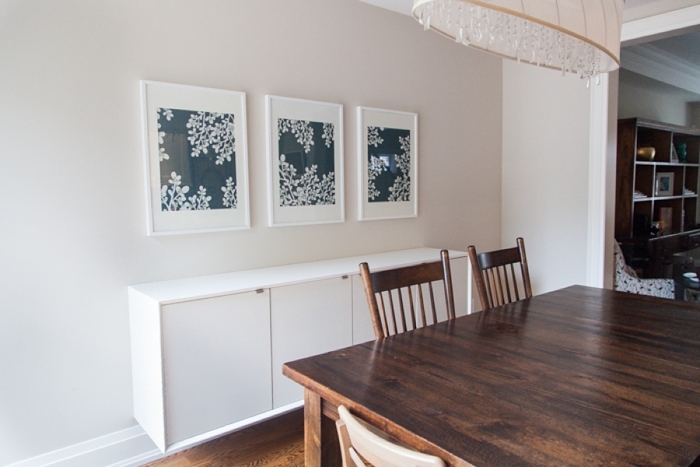 We finally have a new sideboard in our dining room, which replaced the temporary Ikea hutch from our old apartment (unfortunately, “temporary” ended up being more like 3 years). Remember this? Although it took a very long time come to a decision on what to do with the massive blank wall across from the kitchen (while were stuck living with this messy brown eyesore in the corner), I’m SO glad we took our time as I really love the custom floating sideboard that we ended up with. It was worth the wait. 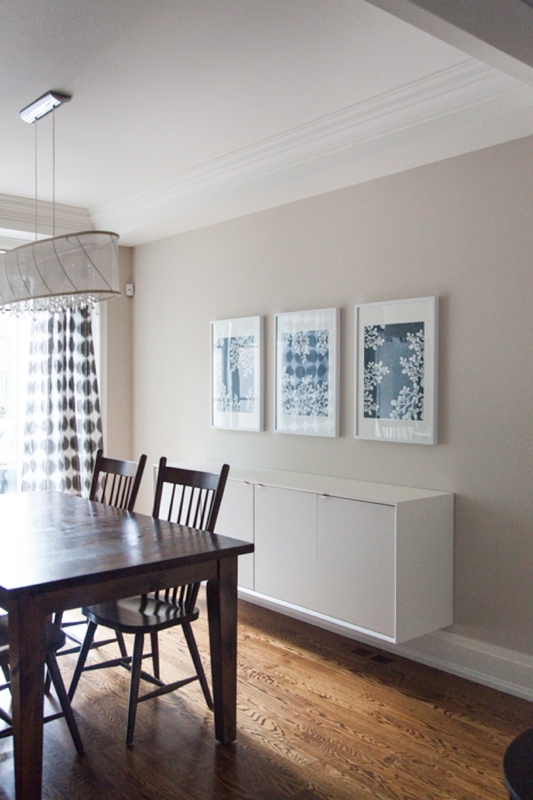 But of course, as soon as the sideboard was adhered to the wall, I was hit with a new decision to make – what would we hang above it!?! In a much more timely manner, I decided that simple was the best way to go, along with some colour, and I started searching for art prints that would work in this space. I quickly found that everything was either the wrong size, or too expensive. Then, BAM, the Marilyn Denis show was on one morning and I caught a glimpse of her studio set – there were 3 large white frames each with a different royal blue print. They looked almost identical, but each print was slightly different. This was exactly the kind of art I was looking for, and exactly the right size. I jumped on to Facebook and sent a message to her team asking where the art was from, and to both my delight and disappointment, I received a response saying that the prints were just high-end gift wrap. This meant I couldn’t just go out and buy the same prints for my room, but at least I had a great idea for how I could create the same look in my home! Step 1: Lay out the 3 sheets of gift wrap on the floor. 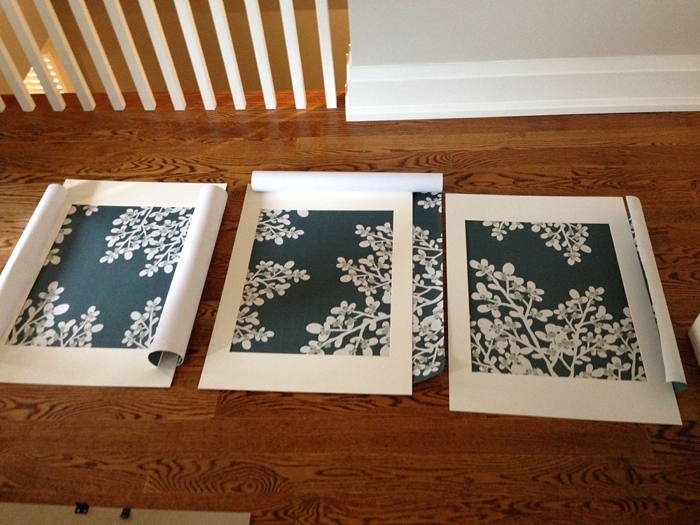 Using the pre-cut mats from the frame, determine how you would like to “crop” (i.e: cut) the paper for each frame. This actually took quite a bit of time for me and involved several photo text messages back and forth to my sister. Step 2: Once you have made a decision on how to crop the paper for each frame, cut the paper down to size and assemble frames. 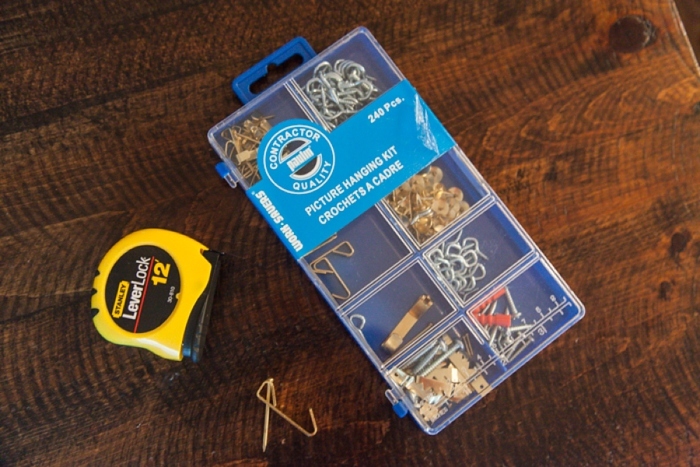 Step 3: Hang the frames, using some basic math and these handy dandy picture-hanger nails (which can be found at your local hardware store). This will most likely be a two person job, unless you have super-duper frame hanging skills. As you can see from the shot below, it took the hubby and me more than one try to get the frames aligned properly. This was easily fixed by adjusting the hanging wire on the back of the frame (so in case you were wondering, we do not have several holes in the wall). They look great. A very resourceful way to brighten up a bland wall.